San Diego Comic-Con is known the world over as the pilgrimage destination of popular culture, held annually in the temperate climes of the Southern California coast. Well over 100,000 nerds, geeks, cosplayers, comics fans and professionals—plus anyone else interested in, well, everything—attend. Maybe that’s the problem with Comic-Con these days. It’s too big, too all-encompassing. It’s lost its focus, and is so big it can’t possibly give anything but the big Hollywood movies the attention it deserves. But as far as Hollywood movies, there was plenty of breaking news to report. The most exciting to me? Marvel Studios announced its slate of upcoming mystery films, and it’s more ambitious than anyone would have guessed. The first of five films leading toward a sequel to this year’s box-office smash The Avengers is Shane Black’s Iron Man 3 (May 3, 2013). That’s being followed by Thor: The Dark World (November 2013). After that, fans should be excited to hear that Marvel is tackling one of the best Captain America stories ever in April 2014’s Captain America: The Winter Soldier. At some point in the schedule, we’re getting Edgar Wright’s long-rumored version of Ant-Man, which is exciting as well. The bold, ambitious move on Marvel’s part, though, is Guardians of the Galaxy, which comes out in August 2014. Guardians of the Galaxy is a Marvel super-team that consists of cosmic beings, living trees and a gun-toting raccoon. It’s out of left field, but it’s something we should all be rooting for. You see, lately the Guardians of the Galaxy comics have had a lot to do with a villain named Thanos. And for those of you who did your homework (and read past columns) know that he’s the big bad guy who was teased at the end of The Avengers. Sure, big-budget comic-book movies are cool to read about, and even cooler to watch, but there were plenty of other impressive things to see and do at Comic-Con that had more to do with the roots of the convention than Hollywood films—like The Walking Dead, a creator-owned comic turned AMC television series. They presented a trailer for season 3 that would blow your mind, and announced that the 100th issue of the comic is the best-selling comic in the industry this month. That means it beat Batman, Spider-Man and every character in between. I even got to take my picture with a zombie, and the new character from the show: Michonne, a sword-wielding badass who would make Daryl, the show’s resident badass, seem like June Cleaver. Perhaps the best part of Comic-Con is the ability to interact with all of your favorite creators on a personal basis. I was able to talk about the influence of Akira Kurosawa on the Usagi Yojimbo comics with the creator himself, Stan Sakai. I talked to Geoff Johns and Scott Snyder, two superstars of DC Comics about what’s coming up with the DC Universe. I got to play the new WiiU. 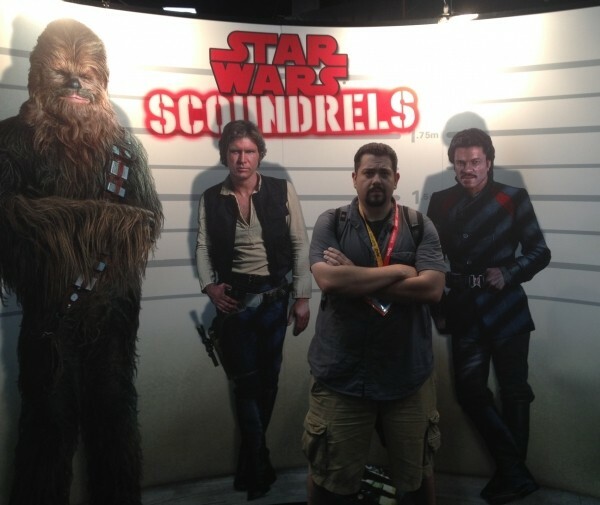 I even got the skinny on the future of Star Wars comics and novels with a front-row seat. And I literally bumped into actress Chase Masterson, which would never have happened anywhere else on the planet. There’s a downside to all of this, though, a price to pay for experiencing such cool stuff: The crowds are too large. You’re constantly pressed up against someone else like in a herd of sweaty cattle because there is no room for personal space. You’re sweating in the sun, waiting in line for everything, from panels and signings to water and food. There are lines to get tickets to get in lines. You’re treated to information firsthand that will be on the Internet in mere moments. Everything is too expensive, too far away, too congested. It’s just too much. It’s so big and anxiety inducing, I’ve sworn for the past few years that “this is my last year going to Comic-Con.” I’m saying it again now. But somehow, I know that isn’t true.